The rapid formation and growth of cities, especially city clusters and megaregions, has become an important factor impacting the global economy and people’s future wellbeing. 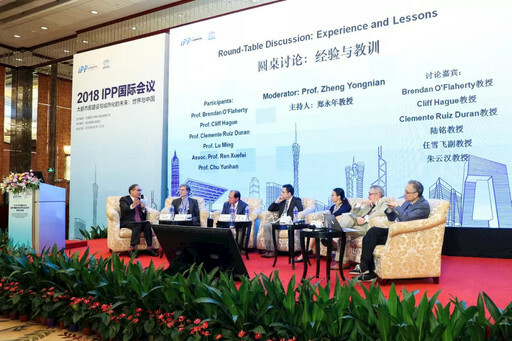 From Aug. 19 to 20, “the 2018 IPP (Institute of Public Policy) International Conference: Metropolitan Circles Development and the Future of Urbanization— The World and China” was held at South China University of Technology in Guangzhou. Experts from all over the world discussed new trends, opportunities and challenges facing the development of the world’s megaregions along with major issues of their growth and management. According to Hans D’ Orville, former UNESCO assistant directorgeneral for strategic planning, China’s explorations and practices in building megaregions can be shared with other countries and regions around the world, so as to deepen theoretical understanding and contribute wisdom to human progress and wellbeing. He added that China is striving to integrate its green development vision with the UN’s sustainable development goals, making great contributions to low-carbon development, circular economies and climate change mitigation. “China has become a leading player in pursuing sustainable and green development, which manifests in much of its urban-rural planning,” he said.